When you think of cancer, what’s the first thing that comes to mind? If you’re like most people, “oral cancer” probably isn’t your answer. As it turns out, though, the risk of oral cancer is increasing, and it’s something that’s been on the mind of more and more Americans and their dentists. As is true with many cancers, the risk of getting oral cancer increases with age. Today, men are twice as likely as women to develop oral cancer, and most oral cancer cases occur in individuals over the age of 55. Here’s what you need to know about oral cancer, and what you can do to maintain a healthy mouth and teeth, and reduce your risk of developing the disease. 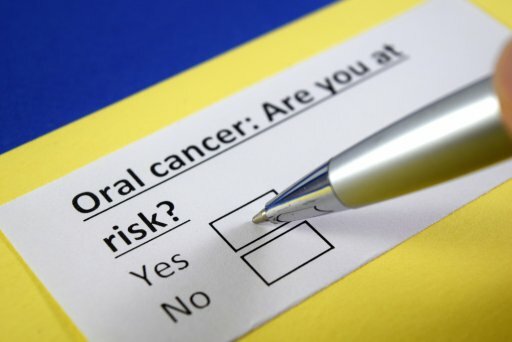 Oral cancer has several risk factors and a few known causes. In general, gender, age, and UV light exposure are all lifestyle risk factors for oral cancer. Oral cancer is twice as common in men as it is in women. It’s also more prevalent in older people, with the average age of diagnosis being 62. Oral cancers are also more common in people who work outdoors or experience prolonged exposure to sunlight. The only known cause for oral cancer is tobacco use. Today, about 80% of people who suffer oral cancer use tobacco in the form of cigarettes or chewing tobacco. Additionally, 70% of oral cancer patients are heavy drinkers. Another factor that is connected to the risk of developing oral cancer is HPV. HPV or human papillomavirus is a condition that includes about 100 associated viruses. While some HPVs cause warts, others are involved in the development of cancer. While HPV is most notably tied to the development of cervical cancer, it is also a risk factor for oropharyngeal cancer, and about 25% of oral cancer patients have the same HPV strains seen in patients with cervical cancers. Get an HPV Vaccine. According to the New York Times, the Food and Drug Administration has approved the HPV vaccine for men and women between 27 and 45. The vaccine protects people who get it from HPV, which can cause everything from genital warts to cancers, including tumors in the throat, which have been on the rise in recent years. Stop Using Tobacco. Tobacco is a significant risk factor when it comes to oral cancer. With this in mind, stop using tobacco. Regardless of whether you smoke cigarettes or chew tobacco, quitting can improve your oral health and protect your mouth for years to come. For support, visit the American Lung Association website. See Your Family Dentist Regularly. Dentists and dental hygienists are often the first to notice potentially cancerous developments on the teeth and gums. Because of this, visiting your dentist on a regular basis for preventative dentistry is the best way to keep your mouth healthy, and to spot problem areas before they become a significant issue. If you’d like to learn more about prevention or maintaining your oral health, visit MouthHealthy.org for information on oral cancer and HPV and oropharyngeal cancer. Want to book an Orange Beach Alabama oral cancer screening or learn more about preventing oral cancer? Contact our office to speak to a staff member today!